In 1956, the TVR sports car used glass reinforced plastic to start producing body shells, as well as steel chassis. 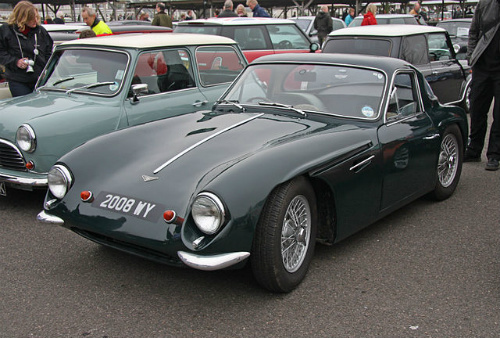 The first successful sports offering, called the TVR Jomar, was presented at the 1957 New York Motor Show. 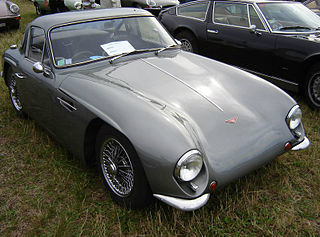 By 1958, with the Jomar renamed the TVR Grantura, the car created a lot of interest which produced a steady flow of orders. However, since the company was unable to keep up with the demand, deliveries began to falter, which resulted in cancelled orders. Fortunately, in 1958, the company was saved by a cash injection, which led to a name change to Layton Sports Cars. By this time, vital US exports ceased with the closure of the only US dealership. The Mark 1 Grantura sports car, launched in 1958, gained a reputation for excellent road holding, and featured 11 inch Girling drum brakes, wire wheels, and sleek body styling. It had a long, front hinged bonnet, with a short rear section, and there was no hatch or opening at the rear. Consequently, anything stored in the boot could only be accessed from within the car, and even the spare wheel had to be removed through the front doors. The moulded fibreglass body was attached to a tubular steel chassis. It had VW-based four wheel independent suspension, with a BMC sourced back axle. The drum brakes were from the Austin Healey 100 convertible, whist the Ford Consul saloon provided the windscreen. However, with the continuing delivery problem, the company fell into debt and, by 1960, was only able to build 100 of the Mark 1's. In late 1960, the Grantura Mark 2 sports variant was launched, fitted with a 1588 cc engine, developing 80 bhp, as used in the MGA, together with improved lighting, and the wings were slightly flared. Once again, there was a variety of alternative engine on offer, including the 997 cc, Ford 105E, and the 1216 cc, Coventry Climax FWE units. The Mark 2 was built for only a few months before further updated were made. Production ended in 1961. Although the Mark 2 sold well, it was replaced in early 1961 with the Grantura Mark 2A sports version, which featured Girling front disc brakes, rack and pinion steering, and a quarter light that could no longer be opened. An optional extra included a specialist aluminium cross flow cylinder head prepared by HRG Derrington. Powered by the 1622 cc engine, it had a top speed of 105 mph, with a 0-60 mph time of 9.6 secs, and fuel consumption of 33 mpg. Production of the Mark 2A ended in September 1962 when a total of 400 units were built, making it the most popular TVR ever built. Interestingly, body shell styling remained unchanged from that used by the early TVR Coupe's in 1958. Unfortunately, another financial rescue in 1961 resulted in the company, once again being renamed, this time to TVR Cars. 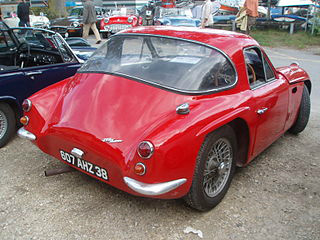 A 1960 TVR Grantura Mark 2 which has been partially restored has a value of around £7,000/$11,000.